Become president of your own motorcycle gang. GTA 5 Online is finally getting the much-requested Bikers DLC. The free update will bring new bikes, weapons, clothes, tattoos, club houses and more to the game, as well as a bunch of new competitive and co-op modes and features. Players will be able to form their own motorcycle club alongside seven other players and take part in “high-level, high-risk vehicle based business ventures” across Los Santos and Blaine County. “Bikers will introduce new roles to play from fresh Prospects to club Presidents with a massive slate of new competitive and co-op gameplay, along with a range of new motorcycles, properties that include MC Clubhouses with a special custom Biker mechanic, and venues for seedy business ventures,” said developer Rockstar Games. 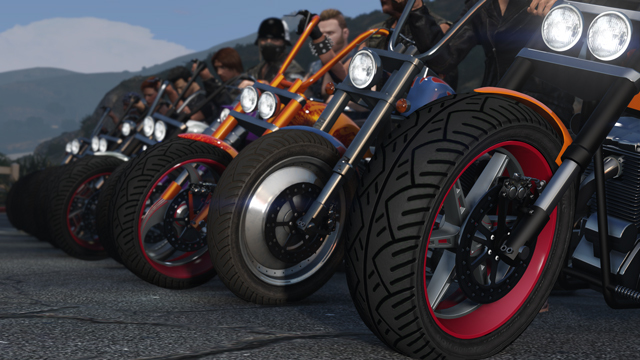 No release date has yet been set for the Bikers DLC. I think he got excited by this. That must be it or its a very sarcastic Awesome! I can just picture Rifty rolling his eyes when he said that "awesome"
Bikers DLC should be out late next week. Bikers will have the ability to engage in melee combat with an assortment of new weapons while riding, which sounds pleasantly Road Rash-ish, although I'm sure (or at least hopeful) that the GTA gameplay will be somewhat more sophisticated. There is a cross section of bikes. Sport, Dirt, Scooters and Choopers. I'll be starting up a Biker gang (Buying a Clubhouse) tonight, just got to research which gang clubhouse to purchase in the most effective location for the buisnesses that can be purchased. Shark cards! Get your Shark cards here! The bikes don't seem too bad at least, much more expensive than the current ones, but they always felt a bit too cheap anyway. New DLC is out...and I hope you have lots of cash! Wish we could sell off garage/apratment/property/buisness that I dont need, or want. Even if it was only 50% back. Might have to downgrade the flash 10 car ones in town to some 2 car shacks out in Grapeseed/Sandy Shores way to get some coin back. Interesting info re recent update. I just got the final Gang NPC car last night before the update, but looks like I'll miss out on collecting the rest. And selling them for a good profit.